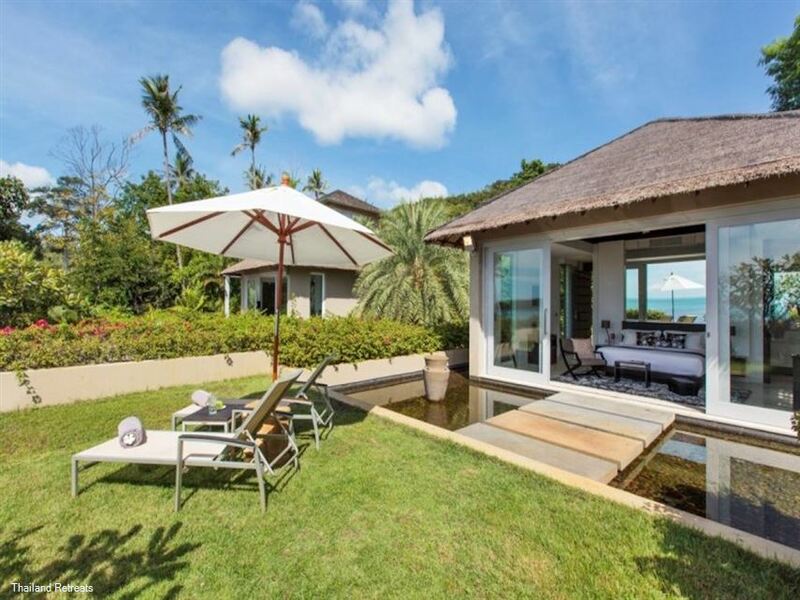 Sangsuri Villa 1 is the largest of three magnificent villas that make up the Sangsuri Estate on Koh Samui and is an expansive property with 9 main bedroom suites plus 2 children's dorm that can be . 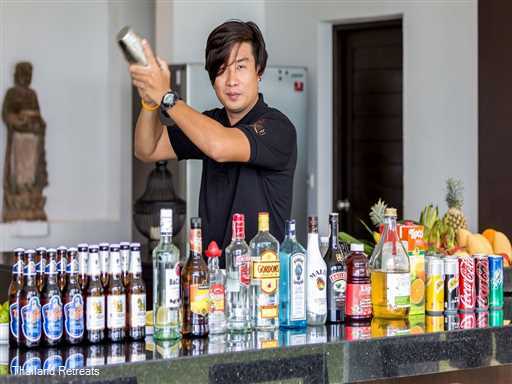 The villa is built over a series of wide, lawned and landscaped terraces that step down to an undisturbed stretch of beach just north of the island's main tourist area, Chaweng. 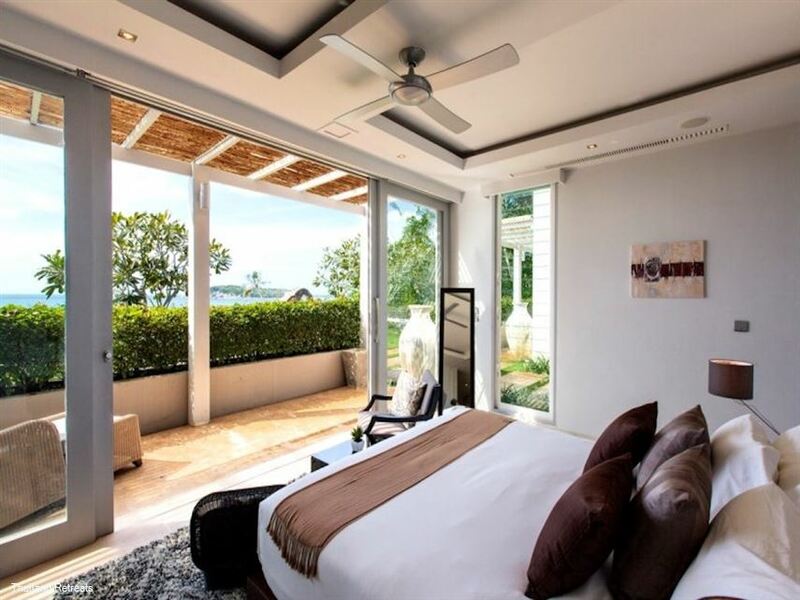 The villa's multiple level house comfortable bedroom pavilions with private sky gardens and sun terraces, all of which draw in calming views of the ocean and a picturesque, uninhabited offshore island known as Koh Matlang. The generous, furnished open-plan lounge and dining space folds open onto a fabulous 22 metre pool and steps lead from a wide beachside lawn directly onto the soft Samui sand. An automated gate at the villa's roadside entrance opens to one of the 2 storey pavilions at this level. 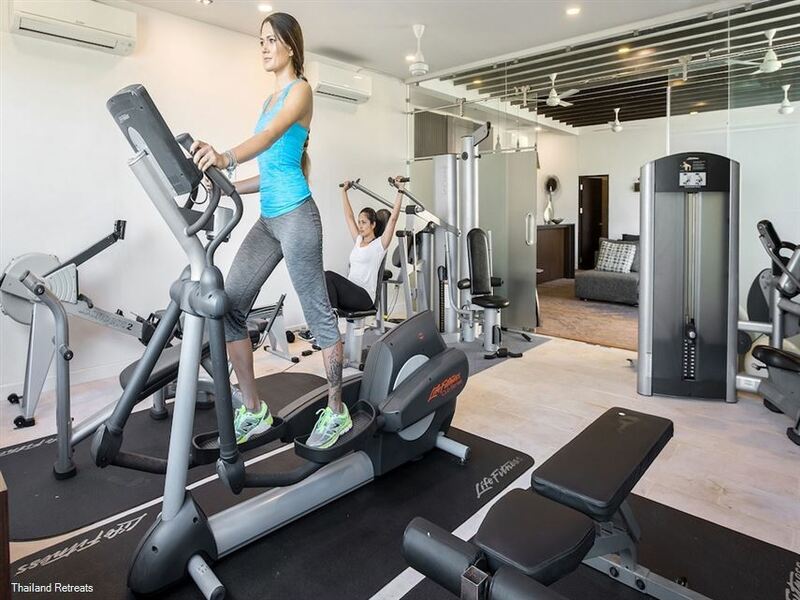 The lower level has a welcome deck, the reception with lounge area, the villa manager's office and the gym. The upper level has the newest bedrooms for Villa Sangsuri 1 (Bedrooms 8 and 9 ) both with ocean views from the windows. Alongside on the same level is another 2 storey pavilion that faces the ocean. The lower level accommodates one of the dorms sleeping 6 in standard single beds that has it's own bathroom and can also be converted to a large double or a family room. Adjacent to it is the games room. The 2nd dorm is on the uper level with 3 x contemorary style bunk beds plus 2 rollout beds sleeping up to 8 young adults / kiddies with en-suite shower room and toilet. A guest or nanny's bedroom is directly opposite the dorm, also with its own en-suite and all offer stunning views of the coast and ocean below. 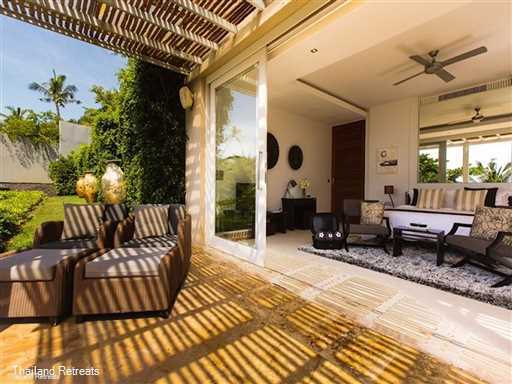 A series of steps lead down to expansive landscaped terraces housing the remaining 4 guest bedrooms suites, living pavilions and master suite at beach level. The next level down is backed by a tall planted wall and opens onto Bedrooms 4 and 5, both of which are surrounded by pebbled water features and boast private garden terraces with spectacular views and the choice of in or outdoor showers in the ensuite bathrooms. Wide central stone steps then lead down to another bedroom level, where Bedrooms 2 and 3 both slide open onto their own covered terraces and lawns. Both bedrooms feature walk-in wardrobes and a choice of indulgent bathing options. Bedroom 3 opens onto an outdoor bath tub, Bedroom 2 onto an outdoor shower. One more level down leads to the villa's open-plan lounge, dining space and double kitchen that open onto a lawned terrace and generous seaview pool.. A resort style kitchen, breakfast area, built-in barbecue and covered, furnished relaxation sala -- plus a separate guest bathroom. 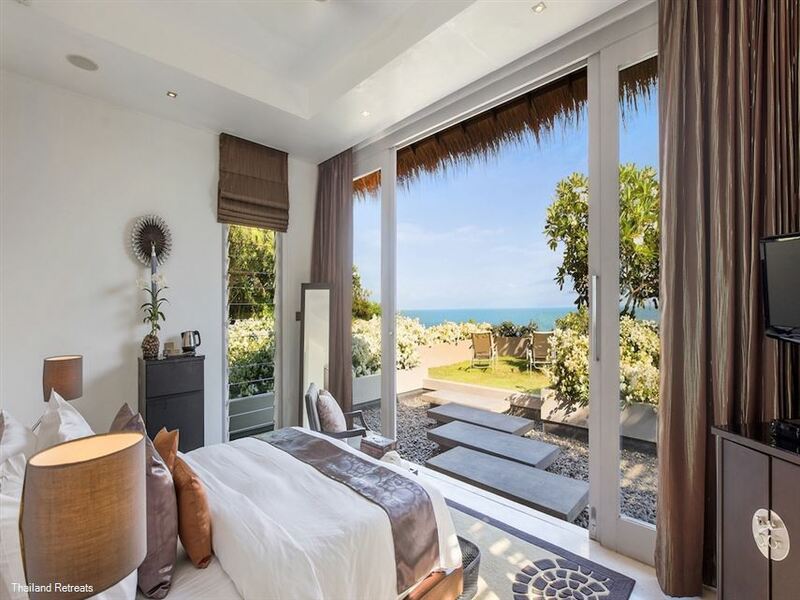 The villa's penultimate level houses the fabulous master suite, which also opens onto a private covered ocean view terrace and boast two bathrooms. 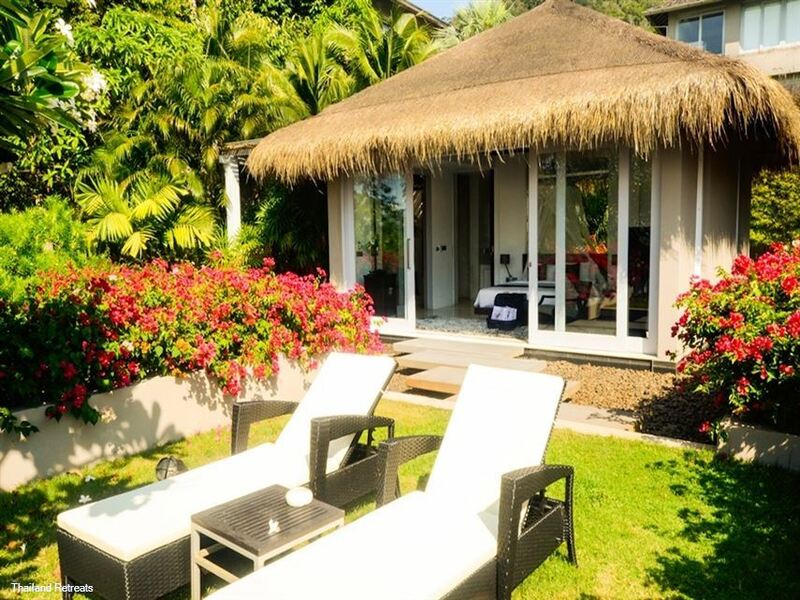 From there, steps lead down to the ocean-side lawn, furnished with sun loungers overlooking the beach. A high wall at one end features a built-in projector screen so the garden can be transformed into an outdoor cinema. The generous, furnished open-plan lounge and dining space folds open onto a fabulous 22 metre pool and steps lead from a wide beachside lawn directly onto the soft Samui sand. Villa Sangsuri 1 is an extravagant private resort hidden away in a stunning, peaceful beachside location. 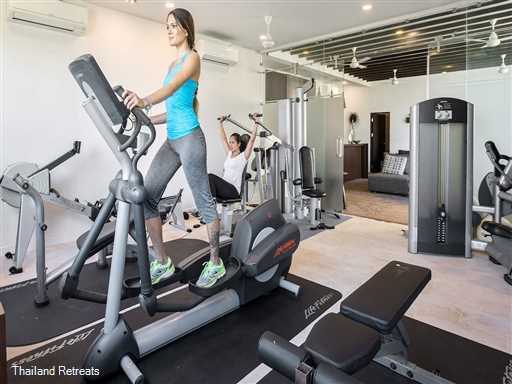 Guests can enjoy every possible private amenity and intelligent designs mean large groups have an appealing blend of communal and private spaces to explore. Evenings are equally relaxed and appealing, with a wide choice of places to gather, socialise and dine under the stars, serenaded by the sound of the gentle sea, always just a stroll away and almost constantly in view. Children will be as content as their parents with a private beach to comb, a generous lawn to play on and of course the unique addition of their own dedicated dorm and TV den to hang out in, safely supervised day and night. Villa Sangsuri 1 is perfect for weddings, anniversary gatherings, parties or just as the ideal place to spend quality time with friends or family in the comfort and privacy of a superlative private beachfront Koh Samui villa and should you need further accommodation for your guests and friends the 6 bedroom Sangsuri Villa 2 and the 4 bedroom Sangsuri Villa 3 make up the remainder of the estate. 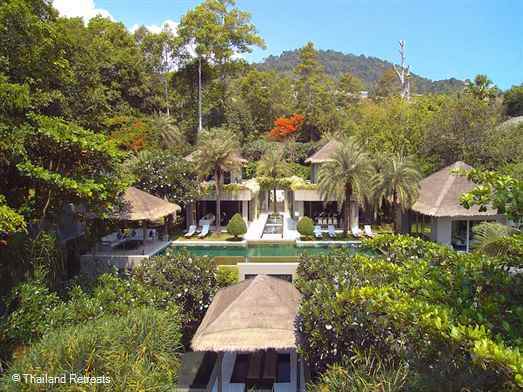 Sangsuri Villas plans to provide guests with an exquisite setting to experience a completely new way to relax and rejuvenate. In the newly created 6000 sm2 Beach Garden Spa. 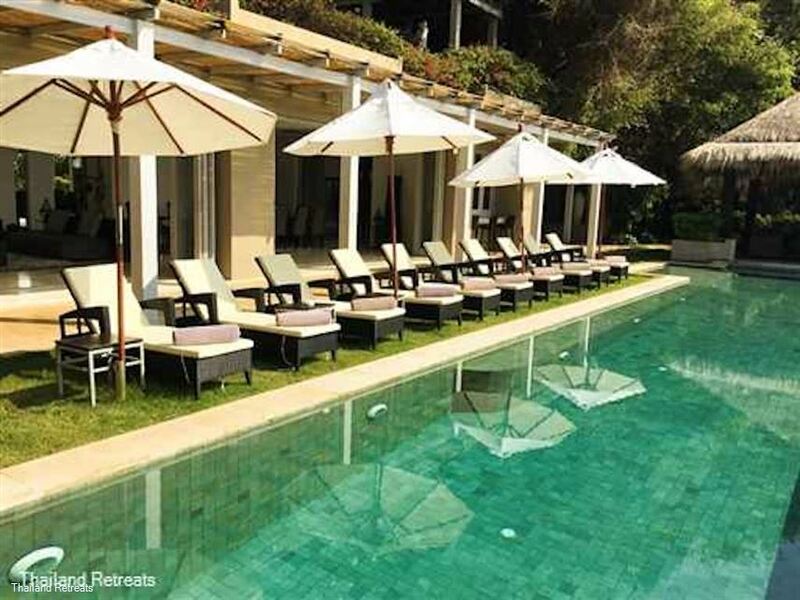 For couples and groups of friends or wedding parties, staying at Sangsuri villas coupled with the Spa offers a unique version of oceanside bliss. 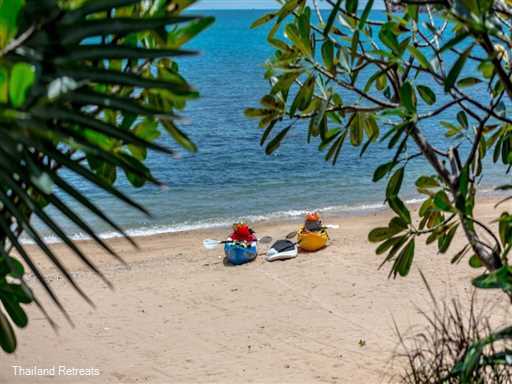 The beach is quiet enough to feel exclusive, yet also boast sufficient services and facilities to make for an unforgettable holiday, free from the hassles and annoyances of busy areas of Koh Samui. 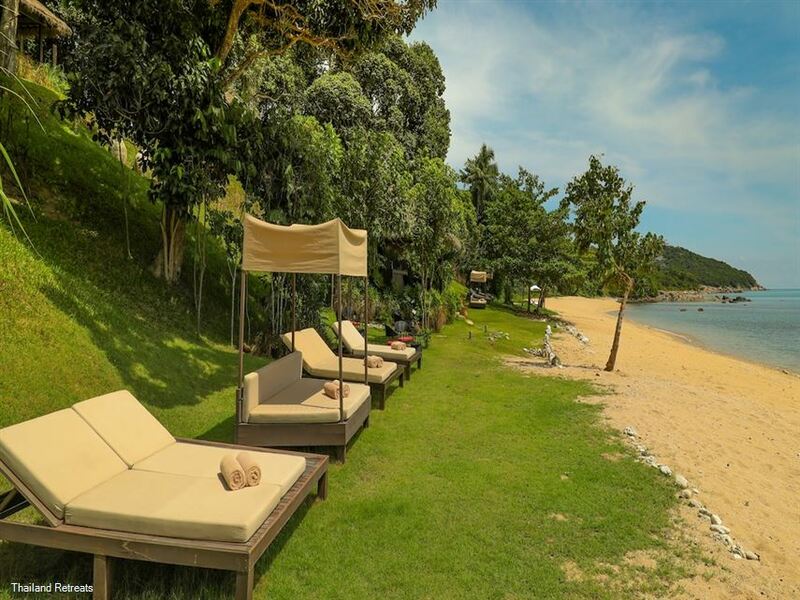 Sangsuri Beach Garden Spa with Eight Thai-inspired double or single treatment Salas are located in different parts of the Garden, with each and every one of them offering an inspiring sea view. The soothing sounds of the waves, combined with the sweet smell of the Frangipani flowers, make the perfect setting for a truly calming Spa Experience or a soothing Meditation, Yoga or Pilates class.Treatments or a class can be booked on the In-Room I-pad or directly with the Villa or Spa Manager. 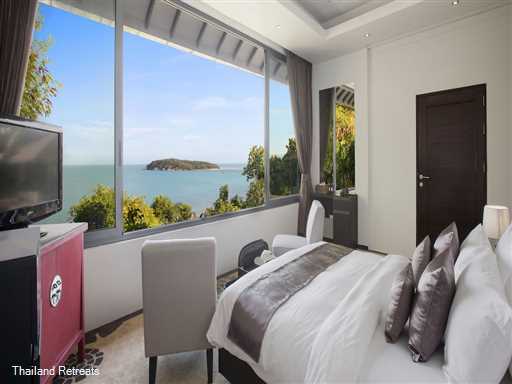 Deluxe sea view bedrooms with en-suite bathroom/shower, aircon and fans, satellite TV, complimentary WIFI. 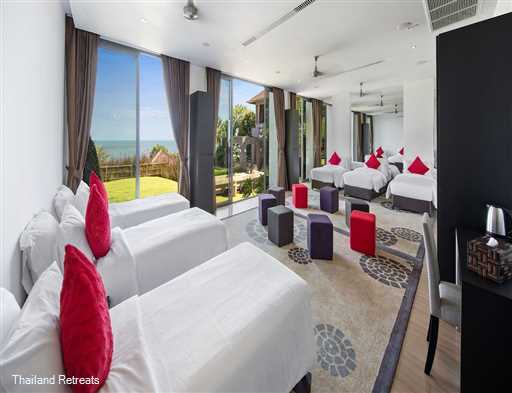 2 complimentary spa vouchers for any massage for each room booked. On site Thai Chef with shopping list available.Food cost on Guests account. Choeng Mon offers a perfect family holiday with something for every member of the family. 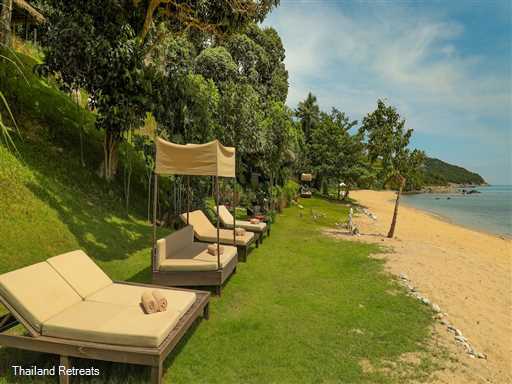 The location has a stunning sandy beach that has swimming all year round and lined with rustic style restaurants with high end hotels at each end of the bay. The village also has a great choice of restaurants together with the usual amenities. 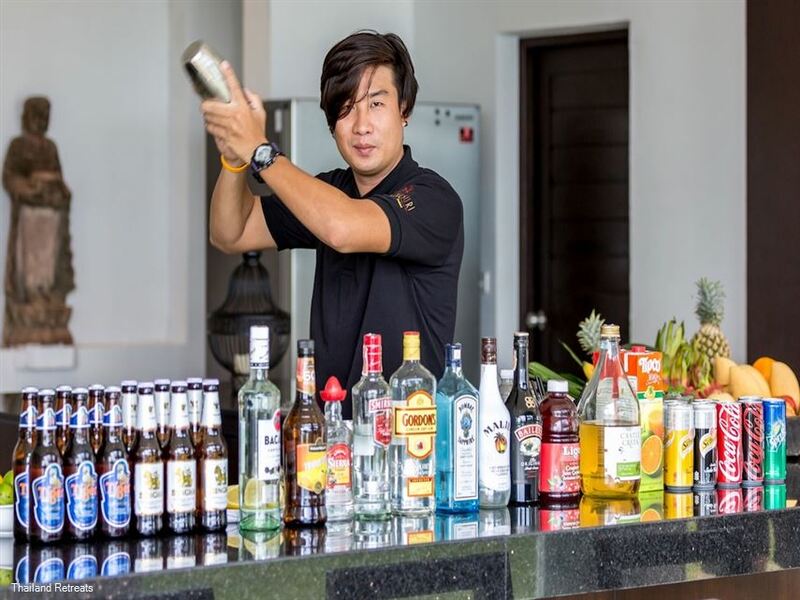 Nightlife is limited to dining out especially on the beach when there may be some entertainment.The location is just 10 minutes from popular Fisherman's Village and lively Chaweng. 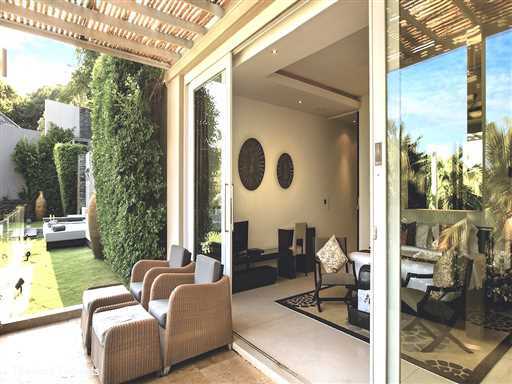 A spacious villa fabulously designed and built over 4 levels cascading down to a secluded cove. Ideal for large families and groups. Offers rates for 2, 3 and 6 bedroom occupancy.